Kanyon fell out of his bed last night. Tonight, he's sleeping on the top bunk. 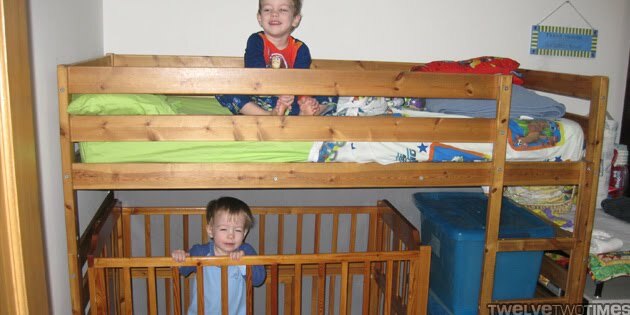 Kanyon fell out of his bed one night and then we decided to rearrange the bedroom and put him on the top bunk. At least on top, there's a rail to keep him from falling off the bed. Corbin moved under the "loft" bed creating a large play area. Teammate 1: "It looks like it was made to be that way." Teammate 2: "It's starting to look like the Blakes (former teammates who had 4 kids in one room)." Teammate 3: "Now you have room for another kid." Or we simply have more room to play and a rail to keep Kanyon on his bed. Plus, he loves climbing the ladder.